The 21-year-old singer admits she was shocked to find out she had inadvertently helped to change a young girl's whole life for the better just by having a hit with her song 'All About That Bass' and she is particularly surprised because she insists he is "not that cool". She said: "I did a show and this father came out and yelled at me, 'Meghan Trainor, you're the best!' My management told me he'd said afterwards, 'Meghan, you saved my daughter's life.' It shook me up so much for months. I kept calling my mum saying, 'I saved a life? It's just a three-minute song!'" At first when you see all these crazy fans you think, I'm not a god, I'm not a doctor, I can't do heart surgery, I'm not that cool - but then there's moments when you see how much you affect their lives and you get it." 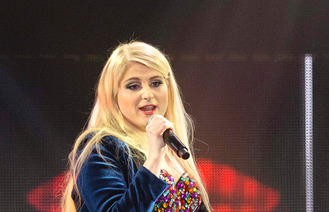 The blonde star also admitted such positive reactions to her music also help to inspire her to get up in the morning. She added to Britain's OK! magazine: "It's my favourite part of the job, because it motivates me when I'm too tired and to get up and beat my face with make-up."